what the website looks like. clean & straightforward. just the way I like it. 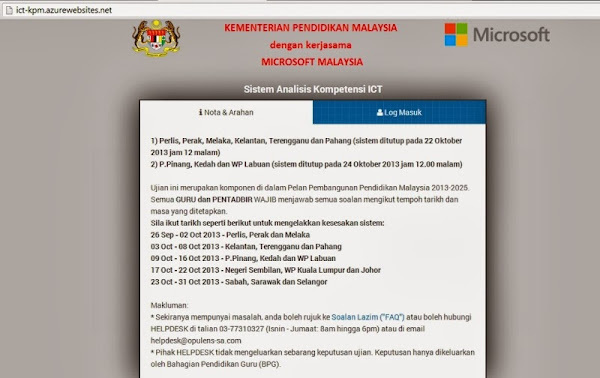 For your information (esp those of you who are not working for MoE), everybody in the ministry has to take an ICT Competency test. The officers & teachers in Perlis, Perak, Melaka, Kelantan, Terengganu, Pahang, Penang, Kedah, Labuan, Negeri Sembilan, KL & Johore have already taken the test. So from 23-31 Oct, its our turn in Sabah, Sarawak & Selangor. Here's the link to the website. #1 FAST & SMOOTH!!! OMG!!! How many of you dread using MoE websites? Esp if it has to do with clerical data entry? It's not the data entry that we dread but the servers which tend to get crowded too often & log us out all of a sudden. Because of this, many teachers wake up in the middle of the night to key in data. Oh, this reminds me, I have to update SPPBS. Dank. No sleep tonight. When navigating & using this website, I cant help but notice how smooth things are running & how fast the website responds. Everything looks good & in its place. Very well thought out website. Then, I noticed at the bottom-right... Powered by Microsoft. No wonder. The website was even better to use than the Cambridge Placement Test website. So feel free to log in at any time of the day to do your test! It's a breeze! I hope that no fundamentalists will castrate me for saying this. The test is bilingual. It's kind of like our PPSMI exam papers. Each question is written in BOTH BM & BI. An ICT test is bound to have plenty of technical terms. The problem is, when translated to BM, the technical terms become EVEN MORE CONFUSING. I started out with the questions in BM because they were the ones on top but I found them really confusing & it took me even longer to answer even simple questions. So I ignored the BM translation & focused solely on the BI part... Worked like a charm. I could finish this test with both my legs & hands tided up & 1 eye blindfolded. Seriously. This test is easy. If you are below 30 years old, you should have no problems with this test because you grew up or were born in the age of the computer. Those of you who use your PC regularly in the English language for work should have no problem. The questions were about computer parts & their functions. Also about the Internet & certain technical terms. I also remember questions each about MS Word, Excel, PowerPoint & Access. Still, they were really easy & there is no need to cram before you take the test. I actually took my sweet time to answer the questions. I was also confused at the beginning with the BM translations. Anyhow, I still got a really sweet time. Think you're better than me? PROVE IT!! I DARE YOU!!! My final time. I took a screenshot before entering my last answer.